It is peculiar how the postal system worked at this time. 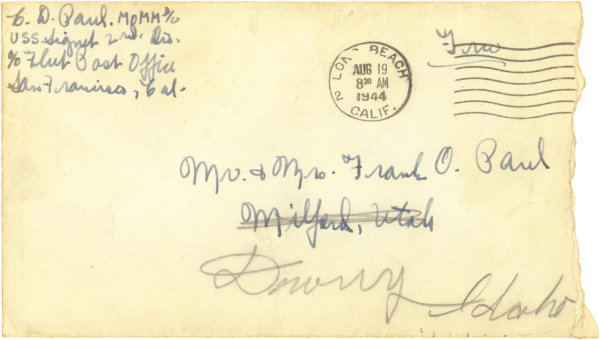 There are several addresses crossed out and rewritten, along with the associated stamps that let you know the envelope actually went through each of these relays before making it to their recipient. There are some fun terms in this letter as well. I translated “cow’s age” but didn’t find any definition online for it. Both “cow’s age” and “crow’s age” seem to be used in extreme rarity and I couldn’t figure out a better translation, thinking it possible that neither of those is what is written. If you know it is another saying, please let me know. Otherwise, it sure looks like “cow’s age”. “Fishful” is another odd term, meaning something is abounding with fish and usually used as an adjective. CDP uses it as a noun in this situation, meaning he is taking some liberties with the word and using it as a measurement for a lot. Keep in mind CDP was as close to a farm boy as you can be, without actually working on a farm. His family was in the West, where much of the area was still pretty close to wild, even in the last century. Idaho and Utah, even now, are not dominantly suburban. His letters and journal are littered with misspellings for words we might find mundane. One that keep tricking me is his use of “kneed”, actually being “need”…presumably hyper-correcting for “know”. In addition to mundane words, when we get into the journal and the later war letters, all of the military terminologies and names of Japanese locales are spelled incorrectly. This was commonplace amongst soldiers, many of whom knew nothing of the Orient prior to being shipped out. Due to secrecy of the situation, soldiers would likely have never seen the names of targets or military terms written or printed on anything, left solely to translate phonetically. You can see the censor has been tightening down. There are multiple references in this letter to wanting to say more, but being bound not to. Chuck mentions his code in this letter, somewhat conspicuously even though it was going through the censor. I’m having trouble figuring out his decoder from the previous letter, so I haven’t tried to pull out the hidden message yet. The “fantail” is a an extension off the back of aircraft-carrying ships that extended the runway for takeoff and landing. The runway on landing ships was just long enough for takeoff, with planes usually dipping before rising as they fell off of the fantail. Inversely, in landing, there was an “arrester” that caught planes (rather abruptly and non-gracefully from accounts I’ve read) before they wrecked into anything else on the deck. Landing was particularly dangerous in night sorties, as turning runway lights on left the ship vulnerable to the enemy ships. Pilots would have to land in the dark, leading to a high volume of wrecked planes. Fortunately, the US was mass producing planes in such force by 1944 that when they became damaged or corroded from the salty air, they would simply get pushed overboard and written off. The flyboys were accustomed to making sea “landings” near their ship, with their cockpit locked open so they wouldn’t get sucked down and could be picked up. Chuck laments his drumming. Chuck was an avid drummer from his youth up until his death in his 80’s. His favorite music was ballroom jazz and naturally Hawaiian music. Into old age, he played in a senior band every weekend. A sense of percussion runs in the family. My father drummed the steering wheel and I do the same, often making up my own counter rhythm to songs…despite never doing anything significantly musical. I could see how, if I had, I’d have naturally followed in Chuck’s path. I’m not sure what he means by making his “rate”. Obviously it is a pay rate of some kind, but from the envelope it doesn’t look like his rank has changed since the last letters. I’m not sure what is going on with the photo from home. He has been requesting it in several letters, obviously not having received it yet. I have a handful of photos of the family from this time period, so it isn’t that one didn’t exist. I wonder if perhaps he was simply not receiving many letters from home. I do not have the reciprocated letters in this dialogue. In this letter, Chuck is still waiting to hear when and where he’ll be going. However, he has been getting exposure to the ship and practicing his shooting. He mentions being in charge of a “kay gun”. A K-gun is not really a gun at all, but a depth charge launcher. The model on this ship would likely have been a Mark 6, introduced in 1941 and used through the end of the war. The K-gun projector would launch an underwater charge with a distance of 60 to 150 yards with impact in less than 5 seconds. Depth charges were used on as anti-submarine warfare. They were not required to come into contact with the submarine, as the shock of the explosion under water was usually enough to put them out of commission. A shakedown is a new ship’s initiation, prior to setting into the open sea. A ship is put through stress tests and drills to make sure it is seaworthy. The tests are both for the integrity of the ship itself and its crew, who is often being freshly introduced to the ship and its capabilities. Also interesting in this letter is Chuck’s “code”. He has come up with a system of passing messages to his family to bypass the censors. I haven’t gotten into the latter letters yet, to see if he ended up using it or not. We’ll see! 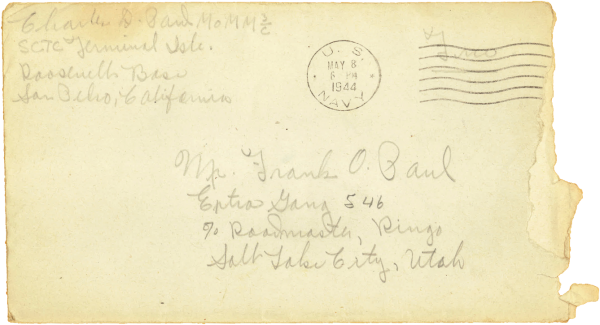 The reply at the end of the letter is Frank O. Paul, signed “FO.” I’m not sure when he would have written on the letter, or why, as I am sure he wouldn’t have been mailing the letter itself back to Chuck. Also regarding his note, I think I’ve read it correctly despite the sentence being incoherent. If you are able to read it as something that is more logical, please let me know. In this letter, Chuck mentions bartering with the “boatswain”. A boatswain is an occupational ranking for a member of a boat’s crew who trains, directs and supervises personnel in charge of ship maintenance duties—a manager of sorts, who acts as a middleman between the authority and the crew. He also talks about a Kay Kyser broadcast he was excited to hear. Kay Kyser (James Kern “Kay” Kyser) was a popular radio personality during WWII. As part of his segment, he was a big band and swing vocalist and bandleader. His bands were in several era films. Chuck’s favorite music was big band and swing, for which he played percussion up until his passing. It isn’t surprising that this surfaces in his letters. 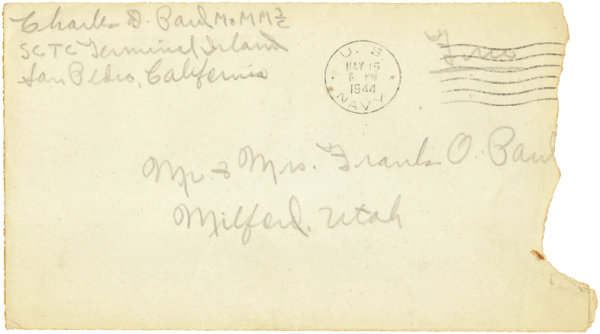 An interesting note is that the recipient address on this envelope is merely a city and state. At the time, Milford must have been a pretty small town. Or, Frank was a well-known city figure. Or, both. I’m not sure if letters would have been delivered to mailboxes, or picked up from a postal office. I grew up in Valdez, Alaska and the postal office was somewhat of a cultural epicenter just like the grocery store. Every day, everyone would stop at the post office to get their mail. I can see how it would be easy enough for a postal office to not need mailbox numbers in a small enough town. Chuck also talks about a bowling alley. It sounds as though he purchased or acquired it himself somehow, then invested money into it. I don’t remember him ever talking about a bowling alley with me, so I’ll have to ask my father about it. Perhaps there is more to that story. The second letter home is also not dated, as later letters all are. 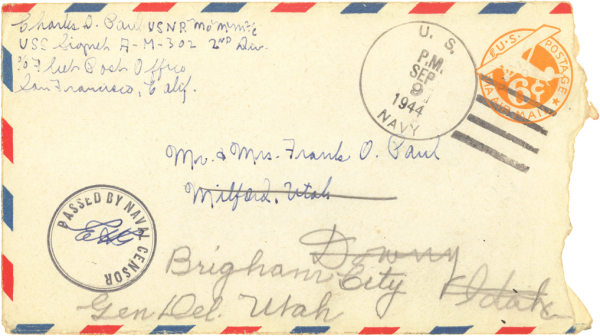 The evening of May 8th is the postal stamp, so the letter was likely written earlier in the same day. In this letter, Chuck mentions Maydean. Maydean is his sister (again, taking into consideration he was adopted, so not a sister by blood…but by family). Also, he asks his adoptive father, Frank, about his current job. Taking note of the way the letter is addressed, Frank was likely doing contracting work of some kind with the railroad. An “Extra Gang” was the term used for seasonal rail workers, from months April to November. Frank was a businessman, with a knack for telecommunications. He would not have been working as a laborer, as the address may imply. This is the only letter addressed in this way. I have finished scanning all 40 or more letters home. CDP averaged one or two per month between early 1944 and early 1946. The stationery is almost as interesting as the letters themselves. One has sailor-themed pinup art I am excited to show you. This is the first of the letters. It is the only letter I do not have dated. 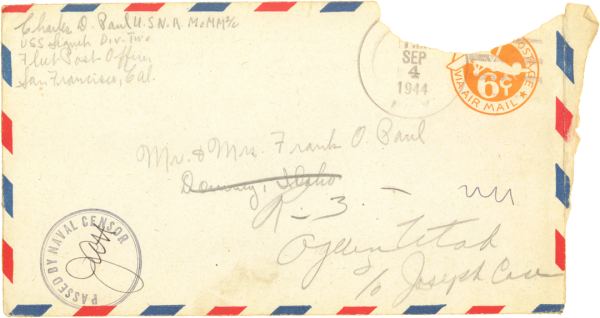 However, it is the same stationery as the second letter, and both are discussing his time in the hospital, getting ready to ship off…so I know this letter predates that letter by a week or more (that letter is May 8th). Below are scans of the letter, along with a transcription that will be easier to read. His mentions of “Don” are his baby brother (remember Chuck was adopted, so the brother is not his blood). At the time of this letter, CDP had finished basic training in 1943 and hadn’t yet been shipped off to Hawaii in preparation for battle. That would happen later in this year. He mentions having earned his MoMM 3/c ranking, which is the Motor Machinist’s Mate, 3rd Class. 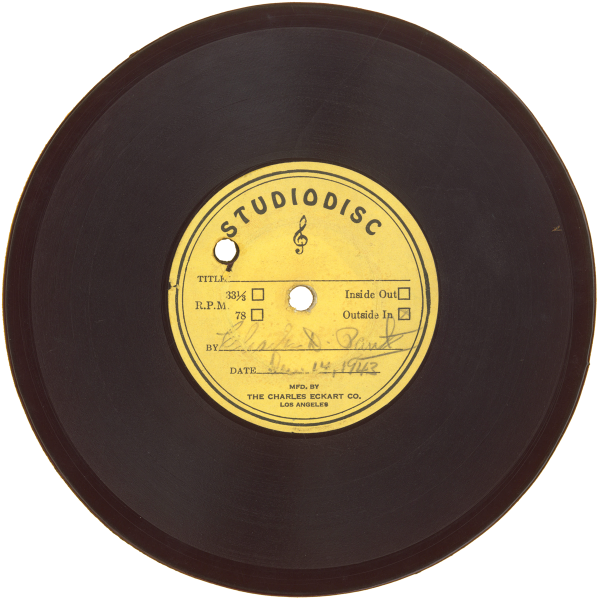 In his audio letter home, from December 1943, he says he is just starting to take classes on motors—so it was roughly a six-month training program between then and now. You are currently browsing the archives for the Soldiers category.